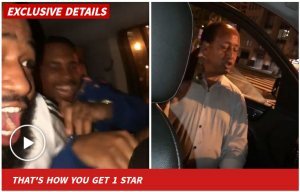 TMZ SPORTS -- Adrien Broner terrorized his Uber driver -- and now he's paying the price ... he's been BANNED from using the app ever again all because he's the passenger from hell, TMZ Sports has learned. The boxing star captured his out-of-control ride on his own social media earlier this week -- trying to turn up from the backseat when Drake and Travis Scott's hit "Sicko Mode" started playing. Broner leans over and unleashes a full-throated scream right in the driver's face -- before grabbing the volume knob and turning it to the max. Then he started wildly dancing -- while the driver tried to focus on driving in the rain. Finally, the driver has enough, slams on the brakes and pulls the car over -- demanding Broner and his crew get the hell out of the vehicle immediately. A rep for Uber tells us ... company officials looked into the incident, and decided Broner's behavior was unacceptable and his access to the app has been revoked.